At this point, FromSoftware needs almost no introduction, having captured gamers’ hearts with their Souls franchise and Bloodborne. 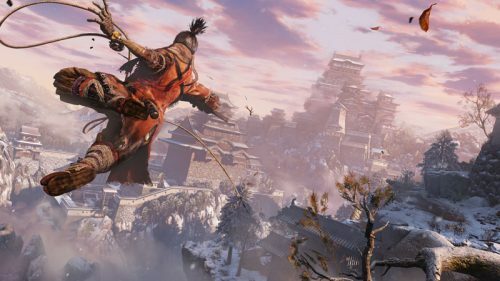 Now, using the same established base formula as those games, they have another franchise in the works, Sekiro: Shadows Die Twice published by Activision, an action adventure title set during the Sengoku era of Japan. Due to shenanigans on the day at Gamescom, I ended up only getting about 10-15 minutes with the title, but that was enough to impress me with how refreshing FromSoftware can make a game like Sekiro feel. Despite sharing some common character controls and design, Sekiro feels like it has its own unique identity apart from its older siblings, namely its speed. 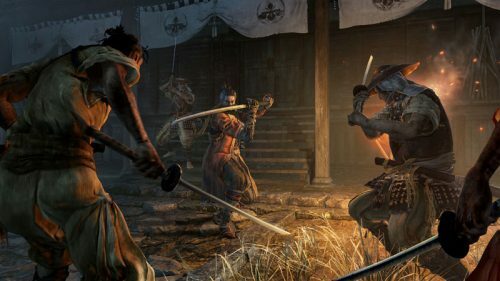 Players move much faster in Sekiro: Shadows Die Twice than even Bloodborne, which makes sense as the protagonist is a shinobi, meant to move quickly and silently. 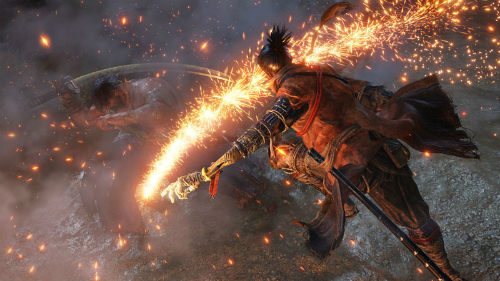 Much like Devil May Cry 5‘s Nero, Sekiro is missing an arm, but has turned this disability to a major advantage by outfitting himself with a prosthetic arm with a very handy grappling hook. This allows you to seamlessly jump between rooftops and swing to new platforms to hide from enemies, as many encounters can be avoided altogether, or headed-off by striking goons who might try to sound an alarm first. If you decide to leap straight into the fray, you can strike from overhead to surprise an enemy to also deal a huge amount of damage. Combat also feels different to Dark Souls, while still sharing some common roots. Instead of whittling down health and keeping a shield up, you only have your samurai sword to rely upon, which means parrying is very important. Battles are one-on-one, and feel like a real samurai duel. Your sword will clash with an opposing enemy’s weapon several times, circling each other while looking for an opening, before making a strike to take them out. If you do take a hit, then like the Estus Flask from Dark Souls, the protagonist has a bottle which they can drink from to restore health. 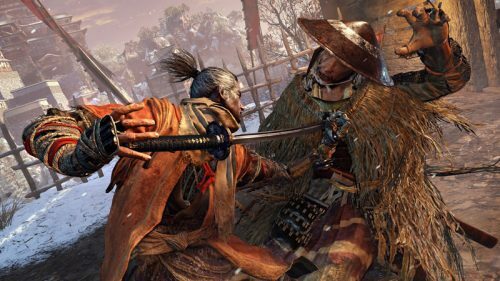 Sekiro also has shurikens he can throw which are effective on some unguarded enemies, but not a sure-fire way of getting past someone’s defenses. Enemy types ranged in the demo from regular soldiers, to fully armoured samurai and to a Souls-style beastie embedded into a restraint. Thanks to the grappling hook, platforming is particularly emphasised in the game, with some areas requiring you to jump between tree branches or find ledges to crawl and swing along to get to the next area. Sometimes you may have to take a leap of faith that there’ll be a grabbable ledge ahead, but luckily the penalty for missing a jump isn’t too severe, and doesn’t set you back too far. Just before our time was up, we came across a boss encounter – a slow-moving decrepit figure who spread purple poison wherever he took a step. The purple area that surrounded him would fill up your poison meter, just like similar areas such as Blighttown from Dark Souls, which meant you have to figure out a way to keep your distance and deal damage, or keep the time you spend within his poisonous area to an absolute minimum. Of course, Sekiro also looks pretty fantastic, with its own distinct style that’s still as detailed and runs as smoothly as Dark Souls 3 did. Sekiro: Shadows Die Twice should definitely be on your radar if you’re a Souls fan, and the game is due out on 22 March 2019 on PS4, Xbox One and PC.